Creamy, cheesy polenta is easy to make and fantastic blank canvas for roasted fall vegetables. Here, nine best polenta recipes to make this fall. This cheesy polenta is layered with thin slices of butternut squash and Parmesan cheese. In the time it takes to heat up frozen lasagna, you can make a from-scratch layered polenta dish that’s every bit as satisfying. This simple sauce is packed with deliciously marbled meat. Fast and healthy, this vegetarian dish is made with a slew of vegetables including sweet potatoes, cauliflower and red onion wedges. 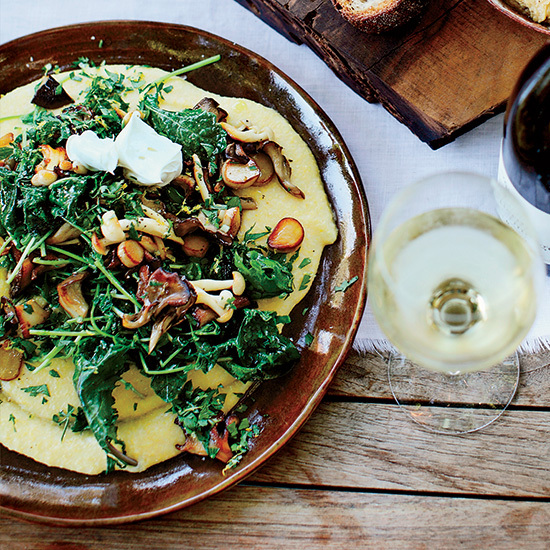 Chef Suzanne Goin adores the straightforward flavors in this vegetarian dish: the sautéed mushrooms and greens and the tangy mascarpone that melts into the creamy polenta. This is comfort food at its finest: a quick-cooking Bolognese sauce, made with sausage, tomatoes, aromatic vegetables, and a touch of light cream, served over a mound of earthy polenta. Creamy polenta is incredible finished with sage-infused melted butter. Pumpkin seeds add a delicious crunch to this perfect early fall dish.